N AVENUE allowing foreigners to buy landed homes without needing official approval has been blocked with new rules governing condominium developments. Strata-landed homes built in condominium estates have enjoyed condo status, meaning foreigners can buy them without restriction, unlike standard landed homes that require the green light from the Government. Under the new rule that kicked in yesterday, the Urban Redevelopment Authority (URA) says it will no longer give condominium status to developments comprising strata-landed homes and apartments within the same development. “Only residential developments comprising purely apartment units and complying with the condominium guidelines will continue to be approved as condominiums,” the URA circular stated. The move is expected to have an impact on foreign buyers in particular, as they have picked up most of these strata- landed homes. The URA added that only projects already granted provisional permission as of Monday this week will continue to be evaluated under the old guidelines. This means foreigners can still buy strata-landed homes without first seeking permission in existing condos and in upcoming projects that have already been approved by URA. Some of the upcoming condo projects that have already secured permission include Far East Organization’s 416-unit Hillsta in Choa Chu Kang, with 20 strata-landed townhouses, and the 338-unit Seahill in West Coast Link, expected to have 18 of such units. The Straits Times understands that Far East has also launched the Woodhaven, The Seawind and euHabitat condo projects with 113 strata-landed units in total. About 45 remain unsold. Experts said the change would choke off the supply of such homes, shutting the back door that has allowed foreigners to move into the landed property market. Foreigners, including permanent residents (PRs), bought about 90 per cent of the 97 strata-landed homes in condominiums sold last year. The level was 60 per cent in 2010, said a URA spokesman. Experts noted that the number of these condo projects has ballooned, as developers chanced upon an opportunity to sell highly sought-after landed homes to foreign buyers without the usual hassle. Condo status projects with strata-landed homes that have already been launched include d’Leedon near Farrer Road, Thomson Grand in Upper Thomson and Archipelago in Bedok Reservoir. Developers told The Straits Times that the changes were unlikely to affect their business plans much. A UOL spokesman said the change should not affect its strategy. Strict conditions apply to foreigners buying landed houses such as bungalows and semi-detached or terraced homes. On mainland Singapore, the main criteria are that they are PRs and make an adequate economic contribution. Approval is given by the Singapore Land Authority’s Land Dealings (Approval) Unit. Non-PR foreigners can buy landed homes only at Sentosa Cove. (SINGAPORE) Starting today , Urban Redevelopment Authority (URA) will no longer allow strata landed homes to be built in projects with ‘condominium’ status. Market watchers say that this will effectively close an avenue which has allowed foreigners to buy strata landed homes within such projects without having to seek permission from the Singapore Land Authority’s Land Dealings (Approval) Unit. In a circular issued yesterday evening, URA said it has observed that ‘in recent years, there has been an increase in the number of condominium proposals comprising a mix of strata landed and apartment units within the same development’. Analysts list D’Leedon in the Farrer Road area, Thomson Grand, euHabitat at Jalan Eunos, Archipelago facing Bedok Reservoir Park and Woodhaven in Woodlands, among the projects with ‘condo’ status containing strata landed homes. Developers have taken to including some strata landed homes within their condo projects to cater to the strong demand for such landed homes from foreign buyers, who don’t need LDAU’s permission to buy them. In contrast, foreigners wishing to buy any other type of landed homes, including units in a pure strata landed housing development, need LDAU’s approval. They have to fulfil certain criteria before LDAU will give the nod, including being a Singapore permanent resident and making significant economic contribution to Singapore. However, under a further tightening in approval criteria last year, approvals to PRs to buy landed homes is expected to fall. Foreigners have increasingly taken to buying strata landed homes in projects with ‘condominium’ status. In its circular yesterday, URA noted: ‘Strata landed housing is essentially a form of landed housing except for its strata title arrangement. Hence, developments comprising only strata landed housing are not accorded condominium status. URA clarified this through a professional circular in October 1994. Credo Real Estate managing director Karamjit Singh noted that ‘developers have been using the current guidelines as a clever way to market their strata landed properties to foreigners because a development scheme comprising strata landed homes within a project approved as ‘condominium’ is open to foreign buying’. ‘With the latest change, URA guidelines are aligned with the general intention to safeguard landed properties for locals,’ he added. Knight Frank chairman Tan Tiong Cheng questioned the rationale behind URA’s rule change to disallow strata landed units in projects with condo status. ‘All the different unit types currently in projects with condo status, including strata landed units, share common facilities and make contributions for the maintenance of the shared facilities and common areas. SHORTER economic cycles coupled with increasingly volatile equity markets have led to a growing desire for safer investment options. In property investments, homebuyers seek to purchase assets that can weather an economic downturn and provide long-term capital appreciation potential. Landed properties, being limited in supply, have often been regarded as a safer property investment option compared to their non-landed counterparts. This has been so in the past few years where a significant number of non-landed units were released to the market through the Government Land Sales (GLS) Programme. In H1 2012, some 7,020 non-landed residential units are expected to be released via the confirmed list while another 7,120 will be supplied through the reserve list. There are no landed sites. While non-landed properties across Singapore have seen higher sales volume in recent years, landed properties have seen higher capital appreciation and proved to be more resilient during a downturn. Should one consider landed homes as an investment option, particularly as the economy becomes more volatile and uncertain? In general, there are four main classes of landed properties in Singapore: Good Class Bungalows (GCBs), conventional landed houses, strata landed houses, and Sentosa Cove landed houses. While there are no restrictions on Singaporeans buying landed properties, permanent residents (PRs) and foreigners face restrictions. On the demand side, landed properties have become more desirable due to strong population growth over the past two decades. In addition to existing high demand from Singaporeans, new citizens who are used to landed living would also seek to own landed properties when settling in Singapore. GCBs may be regarded as the crème de la crème of landed housing on mainland Singapore. These exclusive bungalows, which are located in Singapore’s 39 gazetted GCB Areas, are governed by stringent planning requirements such as a minimum plot size of 1,400 square metres (sq m), maximum site coverage control of 35 per cent and a height restriction of two storeys. GCBs are among the most sought after properties in Singapore and are owned mostly by Singaporean high net worth individuals. Elsewhere in Singapore, conventional landed homes comprise semi-detached, terrace and detached houses. Strata-landed homes are low-rise properties that come with strata titles instead of land titles. Introduced in 1993, this housing type caters to homebuyers who desire bigger space with privacy in a secure gated community. Such homes also offer the convenience of communal facilities such as swimming pools and tennis courts. In the case of strata landed properties within developments with condominium status, foreigners (including PRs) may buy such properties without seeking regulatory approvals. However, for the purchase of other types of landed housing, non-Singaporeans have to seek permission from the Land Dealings (Approval) Unit (LDAU) . Applicants have to fulfil certain criteria before approval is given, including being a Singapore PR and making significant economic contribution to Singapore. Sentosa Cove is the only place in Singapore where even non-Singapore PR foreigners may purchase a landed home, although subject to obtaining LDAU approval. Foreigners granted approval to buy a landed home in Singapore including at Sentosa Cove are required to use the property for their own occupation. They are allowed to own only one landed home in Singapore. 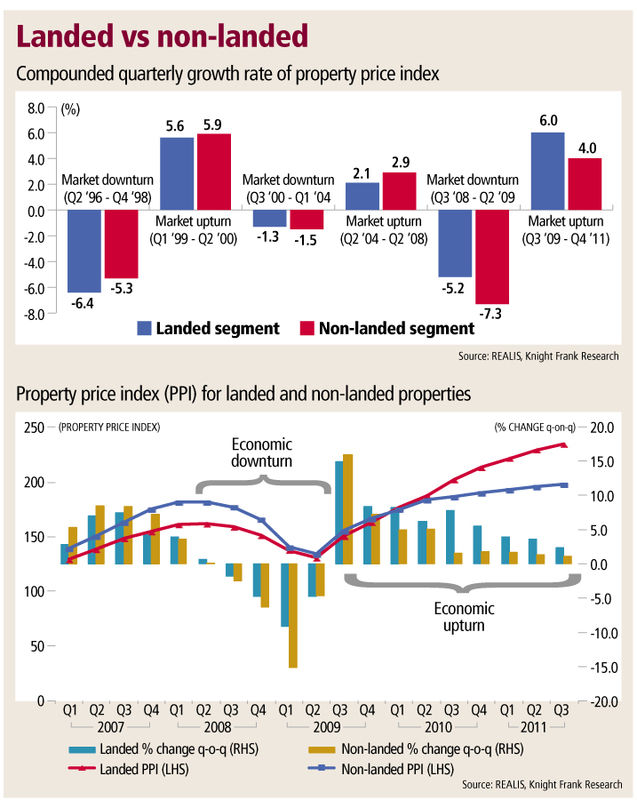 During previous property cycles, prices in the landed segment underperformed the non-landed segment. For example, in the 1996-2000 property cycle, landed properties fell 6.4 per cent, compared with 5.3 per cent for non-landed homes during the market downturn between Q2 1996 and Q4 1998. When the market recovered, landed properties appreciated less than non-landed homes. The weaker performance was also observed in other earlier property cycles. However, the pattern has changed since the global financial crisis. Prices of landed homes have appreciated more than non-landed properties during an upturn and fallen by a smaller magnitude during a market downturn. Fundamental changes in the investment climate and other factors such as limited supply, changes in regulations and government measures may have indirectly contributed to the shift. As the government releases more sites for non-landed developments to cope with increasing demand from a rising population, landed homes as a proportion of total housing stock in Singapore has shrunk. As at end Q4 2011, landed properties accounted for 26.3 per cent of the total housing stock, down from 35.3 per cent in 2000. In absolute numbers, while supply of landed houses has increased, it was at a much slower pace than that for non-landed homes. Over the past 10 years, the rate of increase for landed stock averaged 0.6 per cent (compounded annual growth rate, or CAGR), significantly lower than that of non-landed houses (4 per cent). Under the GLS Programme 2011, there were only two sites slated for landed housing development, with a total of 115 units out of the estimated 23,590 total residential units that can potentially be generated from sites under the confirmed and reserve lists. In the first-half 2012 GLS list, there are no landed housing sites. The stock of GCBs is even more limited with about 2,400 houses in 39 areas, mainly in districts 10, 11, 21 and 23. Recent government initiatives may have boosted the attractiveness of landed homes, leading to stronger demand. More flexibility has been given in the design of landed housing through the introduction of the Envelop Control Approach in September 2010. Under this pilot scheme, architects gain more leeway in terms of design, allowing landed homes to be built up to four storeys instead of being limited to three storeys previously. While encouraging creativity and ensuring practical supply of landed houses, the government also monitors closely the quality of landed housing developments, as evident in the implementation of minimum plot size for strata landed developments in February 2009 where a minimum plot size per unit, depending on its housing form, is prescribed for strata landed homes. Bungalows, semi-detached and terrace houses are required to follow a minimum plot size of 400 sq m, 200 sq m and 150 sq m respectively. The revised guideline reduces the number of strata houses allowable per development and was implemented to resolve concerns of increasingly congested strata landed developments before the measures. After all, strata-landed buyers especially those with larger families prefer the bigger built-up space typical of landed homes but want the convenience of condominium facilities as well. The looming global crisis and slowdown in the Singapore economy in 2012 will inadvertently dampen buying sentiment in the property market and buyers are likely to stay on the market sidelines over the next 12 months while awaiting a more favourable investment climate. Volumes will fall accordingly. However, as compared to non-landed properties, prices of all landed housing types may prove to be more resilient. New supply of landed properties remains limited, providing support notwithstanding an expected slowdown in the economy. The additional buyer’s stamp duty is not expected to have a significant impact on the landed housing market as foreigners, who are largely affected by the new measures, make up a low percentage of landed home buyers. Foreigners (non-PR) accounted for 0.6 per cent of landed property purchases (including Sentosa Cove) in 2010 and 1.8 per cent in 2011. More importantly, the limited supply and prestigious lifestyle offerings continue to back the continuous demand for this evergreen property class. Property 2012 Outlook: How have the Landed Properties Perform so far.